Botox injections and Dermal Filler injections are the most popular cosmetic treatments preformed nationwide, helping thousands to soften and remove wrinkles & rejuvenate their appearance. 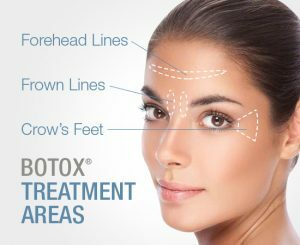 Botox injections are mainly used to smooth dynamic wrinkles, or those wrinkles that form as a result of facial movements like frowning, squinting, smiling, and other expressions we tend to make day after day. Treatment works by temporarily blocking nerve impulses to the muscles, causing them to relax. As a result, your expressions soften and the dynamic wrinkles are greatly reduced. What Types of Wrinkles can Botox Injections Treat? Botox injections are non-surgical and typically completed during a visit to Barron Dental. Your initial treatment will begin with a consultation, during which you will meet with your cosmetic dentist to discuss your concerns and goals. During your consultation, your cosmetic dentist will evaluate your area of concern and go over your medical history. Even though there is little risk of major complications for most patients, it is still imperative that you share your medical history fully and openly with your dentist before treatment, as certain allergies, skin and neurological conditions, or medications can make treatment unsuitable for a patient. For instance, you need to tell us if you are taking blood thinning drugs. Just before the actual treatment, you may be given a topical anaesthetic to numb the area prior to injection, though most patients find this unnecessary, as the needles used to inject botox are very thin and the injections are not very deep. Your dentist will reconstitute the botulinum toxin into a solution, and inject this solution into the muscle at strategic points. Most patients describe a pinching feeling during the injection, though not much pain. You will be able to go back to your normal activities right after treatment, but your cosmetic dentist may ask you to take the day off from exercise or other strenuous activity, and to keep your head upright for the rest of the day. Mild redness, swelling at the injection site, and bruising are the most common side effects, but if any of these side effects do occur, it is generally for a short period of time. Following treatment, you will not see results immediately. This is expected, so do not worry that treatment hasn’t worked. Depending on the patient, product used, and area treated, final results are typically reached 3 to 7 days after initial treatments. If this is your first Botox treatment, your cosmetic dentist may initially inject a more conservative amount and touch up the results during a follow up treatment. This helps to ensure natural, optimal results without the risk of over-treating an area. The wrinkle-reducing effects from Botox treatments will vary depending on the patient, the area treated, and the product used, but results will typically last anywhere from 3 to 6 months. To maintain your results, your cosmetic dentist will simply repeat treatment, adjusting dosage and techniques as necessary to ensure optimal results. What Else Can Botox Help With? • Reduce excessive sweating. Botox injections can be used to interrupt the nerve impulses that activate the sweat glands, helping alleviate embarrassment from excessive sweating on the armpits, hands or feet. • Soften vertical neck bands. If you are bothered by prominent vertical bands on your neck, Botox can be used to relax the responsible muscles and give your neck a smoother, softer appearance. With an experienced, qualified provider, Botox provides a natural-looking rejuvenation with a safe, convenient procedure with virtually no downtime. 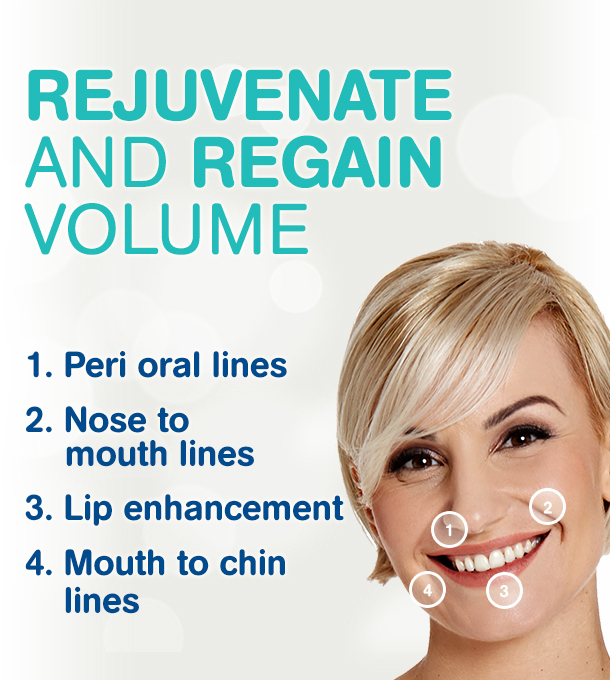 Did you know that many visible signs of ageing can be traced back to volume loss? As facial tissues thin out, lines become etched around the nose and mouth and cheeks look a little hollow. Dermal fillers can replace lost volume to help smooth wrinkles, plump the lips, and restore a more youthful appearance. Dermal fillers are gel-like substances that are injected beneath the skin to restore lost volume, smooth fine lines and deep creases, or enhance facial contours. Over the last few years, thousands of men and women annually in the UK have chosen this popular facial rejuvenation treatment, which can be a cost-effective way to look younger without surgery or downtime. Hyaluronic acid is a naturally occurring substance that is already found in your skin. It helps keep skin plump and hydrated. HA fillers are typically soft and gel-like. The results are temporary, lasting 6 to 12 months or longer before the body gradually and naturally absorbs the particles. Certain HA fillers are infused with lignocaine (anaesthetic) to help minimise discomfort during and after treatment. The most popular brands of dermal fillers used are Juvederm and Restylane. Both are available at Barron Dental. to discuss your concerns and goals. During your consultation, your cosmetic dentist will evaluate your areas of concern and review your medical history. While the risks associated with dermal fillers are minimal, you need to fully disclose your medical history prior to treatment, as certain allergies, skin and neurological conditions, or medications can jeopardise your safety or results. For instance, you need to tell your dentist if you are on blood thinners. Just before treatment, the area will be cleaned, and you may be given a topical anaesthetic to numb the area prior to injection. Many filler products also contain lignocaine, a mild anaesthetic, which is intended to help minimise discomfort during and after your treatment. Your provider will then inject a precise amount of filler strategically beneath the skin. Depending on the product and the areas treated, you should be able to notice results immediately after receiving filler injections. Some patients experience mild bruising and swelling, but these are temporary and should subside over the days following treatment. You will be able to go back to your normal activities right after treatment, but your cosmetic dentist may ask you to take the day off from exercise or other strenuous activity. How long the effects of dermal filler treatments will last varies widely, depending on the product used, the area of treatment, and the patient. Generally speaking, the denser the product is and the more deeply it is injected, the longer it will last, although this is not a hard and fast rule. They typically last 9 to 12 months. To maintain your results, your cosmetic dentist can repeat treatment, adjusting the amount and techniques as necessary to ensure optimal results. Dental Implants – Can I Get One? Walk In Dental Clinic on Why should I floss? melobytes.com on Why should I floss?